Porous materials offer unique properties that have lead to great interest in utilizing them as materials for many applications ranging from drug delivery and imaging, chemical and biomolecule sensing, to catalysis, light emission, biomaterials, optoelectronics, photovoltaics and many others. 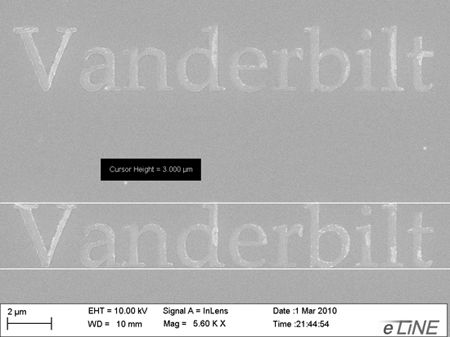 However, patterning these materials, which is necessary to fabricate many device structures and particles, 3-D morphologies, arrays, gratings and a variety of important optical structures, requires the use of lithographic techniques that add both time and cost to device fabrication. Example methods used to pattern porous materials such as porous silicon include photolithographic patterning and reactive ion etching, ion implantation, UV laser ablation, localized photo-oxidation, and dry removal soft lithography. Our technique, coined “Direct imprinting of porous substrates,” or DIPS, is a direct-to-device technique for mechanically deforming porous nanomaterials to produce well-defined micro- and nano structures. While repeatably producing nanoscale features (<100nm) the overall process is remarkably simple, rapid, and low-cost. 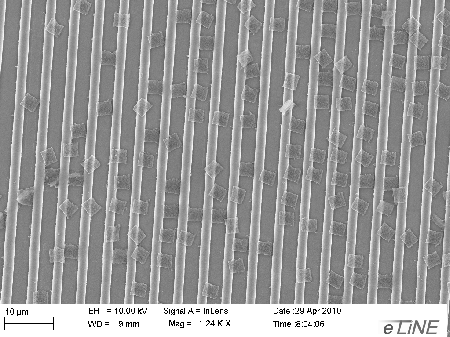 Top view SEM image of porous silicon patterned by DIPS. Free standing porous silicon microparticles fabricated by performing DIPS with a silicon grating stamp, rotating 90 degrees and stamping again. In this image, the particles are sitting on the original stamp used to define them.